Nothing particularly substantial has come from Bend Studio’s Days Gone since its showing at E3 2018. With the game’s release date slowly drawing near, momentum is bound to pick up soon. The first stage of said momentum has arrived in the form of official key art. It’s a simple, yet stunning image of the protagonist, Deacon, resting against his motorcycle beneath a tree. Strewn about him are the corpses of zombie-like creatures, referred to as Freakers in Days Gone. Hordes of other Freakers storm towards Deacon from behind. Meanwhile, the greenery of nature, a blue lake, and gorgeous mountainous terrain provides a beautiful backdrop that offsets the unnatural chaos in the image’s foreground. Again, it is stunning. Whether or not this image will serve as Days Gone’s box art remains to be seen. Many PlayStation exclusives have come with alternate box art that fans can turn inside out at their leisure. Examples of this include Horizon: Zero Dawn, God of War, and Marvel’s Spider-Man. Might the above key art imagery be something similar for Days Gone? It’s possible. Despite the middling hype that presently surrounds it, Days Gone does look impressive. Bend Studio’s focusing on developing mechanics that capture some semblance of realism stands among the game’s most intriguing qualities. 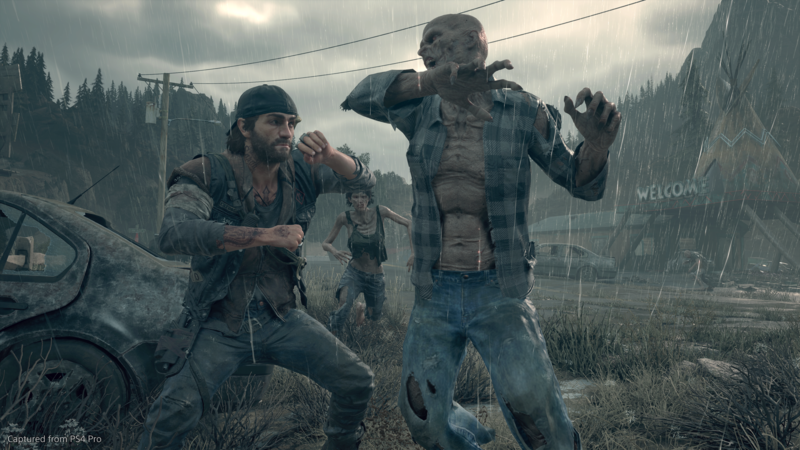 The same is true of Days Gone’s “dynamic and living” world, which will appropriately react to Deacon’s behavior. Days Gone releases on the PlayStation 4 early next year on February 22, 2019.